Music history: He has too many ex-bands (more than other band members) so his past is a bit unclear and he can't remember it properly. So with some difficulties he is only able to recount the following bluegrass set-ups: Sailors, Daybreak, Iluze, Přísně tajné, Torzo, Forte, Pražská čtvrť, Wejlet. Besides, he is currently a member of some other music projects, that are dissimilar to bluegrass music but that doesn't diminish their value whether it is the duo with Tereza Bečičková, the vocal group Let's Go!, the ensemble Gospel Time or other bands. 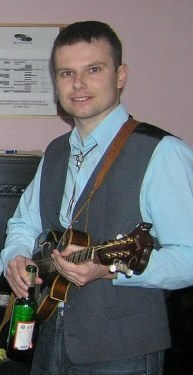 Moreover, he is an executive member of the Czech bluegrass music association.